Caption SUNDAY AUGUST 7th 12 - 6PM THE JERRY GARCIA AMPHITHEATER 40 John F. Shelley Drive San Francisco **** a free event featuring four bands arts and crafts booths **** ! 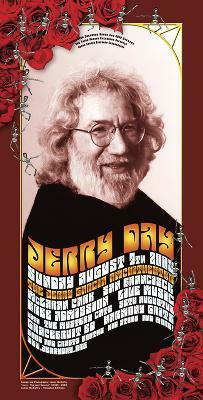 ***********On August 7th 2005 the Excelsior Cultural Group and EDIA will present the 3rd Annual Excelsior District Jerry Garcia Birthday Celebration Jerry Day 2005 at the Jerry Garcia Amphitheater. Jerry Garcia as most people know was one of the biggest musical icons of our time the leader of the Grateful Dead and a native son of the Excelsior who grew up at 87 Harrington Street. Due to the success of this event including the renaming of the Amphitheatre in McClaren Park there has been a tremendous amount of increase in the use and awareness of the Jerry Garcia Amphitheater! The Amphitheater combined with a shuttle bus to and from the Balboa BART station is a great combination for an event of up to 2000 folks. Join in at the Jerry Garcia Amphitheater for a great community event celebrating the Excelsior District's Native son - Jerry Garcia on August 7th! For more information or to get involved please feel free to contact the Jerry Day Committee at [email protected] Fiscal Sponsorship for Jerry Day is provided by the Excelsior District Improvement Association. Come and celebrate the life and music of Jerry in the Excelsior District the neighborhood where he grew up!